Described by House & Garden from where the recipe emanates as ‘comfort food without the calories’. Not a bad idea after all that Christmas fare. For the topping, cut the squash into chunks and spread on a baking tray. Drizzle lightly with oil and roast for about 25 minutes, or until tender. Mash with the butter. Add the ginger and season with a little salt and pepper. Heat the oil in a frying pan over a low heat and fry the garlic, onion, carrots and celery for about 7-10 minutes, or until softened. Add the beef mince and fry until coloured, breaking up any lumps as you fry. Add the chopped tomatoes, Worcestershire sauce, bay leaf, stock and rosemary. Bring to the boil then reduce the heat and simmer for 4-5 minutes until the liquid has reduced by half. Season to taste with a dash of Tabasco and salt and pepper. Stir in the parsley. 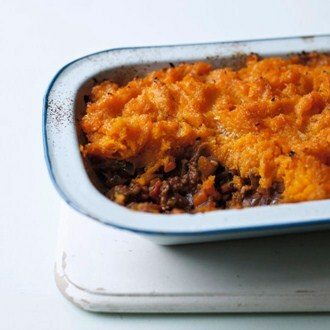 Spoon the beef mixture into a medium pie dish and top with the butternut mash. Place on a baking sheet or tray and bake for 25-30 minutes. Easy, tasty and low calorie.